New targeted and immunotherapy drugs have changed the diagnosis of metastatic melanoma from a death sentence into a disease that can potentially be managed and even cured. Nevertheless, these new drugs do not work in all patients, or they may stop working after a transient response. This post (part one of two) will describe ongoing efforts to find drug combinations with higher efficacy than single drugs and decipher the mechanisms underlying drug resistance. The combination of targeted drugs is already a reality in the treatment of BRAF-mutant melanoma. BRAF inhibitors are no longer used as standalone drugs, but are combined with MEK inhibitors; clinical trials have demonstrated the superiority of this combination. The U.S. Food and Drug Administration (FDA) has approved two targeted drug combinations that inhibit BRAF and MEK: dabrafenib (Tafinlar) with trametinib (Mekinist), and vemurafenib (Zelboraf) with cobimetinib (Cotelic). Even when these combinations were still being explored in clinical trials, it had already become clear that they are associated not only with higher response rates, but also with fewer toxicities (side effects) than BRAF inhibitors given alone. In addition, long-term follow-up data indicate that responses are more durable: the median overall survival time is 25 months for patients receiving dabrafenib and trametinib, and this is expected to hold true for the combination of vemurafenib and cobimetinib. In comparison, the median overall survival with vemurafenib alone was 13 months. The PD-1-blocking immune drugs nivolumab (Opdivo) and pembrolizumab (Keytruda) are now FDA-approved not only as a second line of treatment, but also for newly diagnosed melanoma, regardless of BRAF status. Ipilimumab (Yervoy), an older immune checkpoint inhibitor that blocks the protein CTLA-4, is no longer used on its own in metastatic melanoma because anti-PD-1 drugs have higher efficacy. However, the combination of nivolumab with ipilimumab is now also FDA-approved. Results from the CheckMate 067 clinical trial showed that this combination had a 2-year overall survival rate of 64%. It has a higher response rate and more durable responses (progression-free survival) than either ipilimumab or nivolumab alone, and the available data on overall survival are fully expected to favor the combination. The downside of using this combination is its far more frequent and serious side effects, sometimes of autoimmune nature. While many can be managed with steroid drugs, autoimmune impairment in endocrine organs most often requires discontinuation of treatment. Analysis of the results of another randomized trial, CheckMate 069, showed that a significant percentage of patients (30%) receiving the combination discontinued treatment due to serious adverse effects. However, and most encouragingly, patients who stopped treatment with the combination still had a response rate of 68%, with 27% achieving a complete response. Among specialists, it seems there is no consensus on whether to use an anti-PD-1 drug as a single agent or to use a combination of nivolumab and ipilimumab up front (as the first treatment). Perhaps once more experience is gathered on how to more effectively monitor and treat side effects frequently associated with the combination, there will be more willingness to use it. There is also the possibility that dosing and/or frequency of the drugs’ administration could be modified in order to reduce side effects while maintaining efficacy. Less than two years ago, I wrote about melanoma clinical trials that combine immunotherapy and other drugs. I could, back then, include a complete list of such trials in the blog post because there were fewer than 20. There are now well over 100 trials with drug combinations, and while it is not practical to list them all, some promising ones are described here. Combinations of immune and targeted therapies in melanoma are still being explored, but the hope of seeing an astonishing increase in activity has been somewhat dashed. One ongoing trial that combines atezolizumab (a PD-L1-blocker) with vemurafenib has been open for nearly 4 years now, but no results have been reported so far. Other checkpoint inhibitors have also entered clinical trials. Successful targeting of PD-1 and PD-L1 has prompted the development of drugs that either block or activate some of the many regulatory proteins on immune system T cells (OX40, CD40, GITR, CD137, and more). These antibody drugs are in early-phase trials for a variety of tumors, with many trials testing new drugs as single agents first, and then in combination with other checkpoint drugs. The goal of this early testing is not only to determine the safety of new treatments, but also to find types of cancer that show a tendency to respond better. Hopefully melanoma will be amongst the cancer types that have a good response to new immunotherapy drugs, sustaining its reputation as a poster child for their efficacy. The major problem with immunotherapy drugs is that many patients fail to respond to them. Several factors have emerged that can help predict a patient’s response, but they are very far from being perfect. The presence of T cells in a tumor prior to the initiation of treatment is a good sign, signaling that tumor is immunogenic enough to attract the attention of the immune system. Expression of PD-L1 on melanoma cells is only somewhat predictive of a good response, even though it may be associated with the presence of T cells within the tumor. The other positive predictive marker of response is the presence of many mutations in the tumor (aka mutational burden), which results in the production of mutated proteins that can be recognized by the immune system as “foreign” entities. None of these features, however, reliably predict a patient’s response to immune checkpoint drugs. 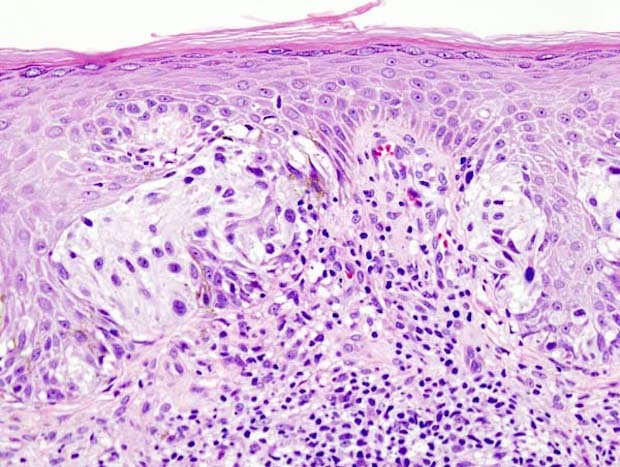 A recent study looked at features of melanoma tumors that are associated with a lack of response to anti-PD-1 therapy and found some common themes. It seems there are global patterns of gene expression in drug-resistant melanoma tumors, such as their ability to change the tumor microenvironment, attract blood supply, invade, acquire less differentiated character, and more. These are unfavorable predictors of response to immunotherapy drugs, but also to BRAF/MEK inhibitors. It is becoming clear that trying to select patients for immunotherapy based on the likelihood of a good response is going to be difficult, possibly requiring a global analysis of gene expression. Responses to checkpoint drugs may be not as high as desired, but they are usually durable—with some exceptions. A very recent study came up with some unsettling conclusions about why some patients (about 25%) first show a good response to PD-1 blockade, only to relapse later. Full sequencing analysis of tumors before and after treatment was performed in four melanoma patients who first responded to anti-PD-1 drugs and then experienced a relapse. In three out of four patients, relapsing tumors had new mutations in genes that play a critical role in how cells respond to immune attack by activated T cells. The striking observation was that the activated T cells were still present in the tumors that relapsed; it was a powerful indicator that the immune system was still primed and ready to attack the tumor cells, but the latter had evolved to resist the attack. This was a very small study, and it will need to be extended to more patients who stop responding to anti-PD-1 drugs, but the findings are troubling. Development of resistance was thought to be a major problem with targeted drugs, and the discovery of melanoma’s ability to escape immune attack through the acquisition of new mutations is worrisome, to say the least. This is part 1 of a 2-part post on the latest research in melanoma. Read part 2 here.